When they first landed on its shores in the 1500s, the Portuguese discovered a vast stretch of verdant rainforest cloaking much of the Atlantic coast of what would one day be Brazil. Through centuries of deforestation, only 7% of this forest’s original area remains in remnants scattered within the most densely populated region of Brazil. As is most often the case, lowland rainforest habitats suffered the most with an almost complete loss of this habitat. Regardless, these remaining pockets of Atlantic Rainforest harbor an incredibly diverse and often highly endangered collection of bird species with well over a 100 regional endemics. 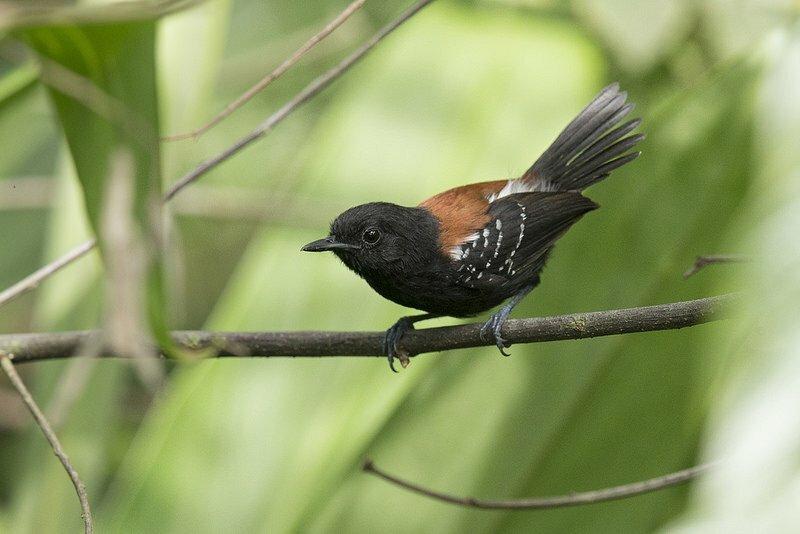 The sprightly Black-hooded Antwren is one of these species. First collected and described in the 19th century, this little bird escaped detection for over 100 years until its rediscovery in 1987. Currently, there is a rough estimate of 1,000 to 3,000 individuals left in the population split between seven sites around Ilha Grande Bay in Rio de Janeiro state. Although apparently preferring weedy secondary growth and even tolerating abandoned banana plantations, it is unable to survive the wholesale destruction of its lowland habitat for beachside tourism and Euterpe sp. palm plantations (the same palm that produces açai berries, one of the latest health crazes). In addition to this one, southeast Brazil has several poorly known antwren species such as Sao Paulo Antwren (described in 2013, lumped with Parana Antwren) and Restinga Antwren (described in 1990) which are known from just a few sites that are also endangered. Black-hooded Antwren is still common along the dirt road at Pereque. Photo courtesy of Fabio Rage. On October 31st, 2013, Dalcio Dacol and I left our lodging in the small beachside town of Ubatuba well before dawn in order to arrive in the town of Pereque early in the morning. At around 8:00AM, we arrived at our turnoff down a dirt road. Although the habitat seemed heavily altered with few large trees, the road proved to be full of birds. One of the first birds we saw was the beautiful ariel subspecies of the Channel-billed Toucan with its vivid orange throat and breast. Feeding flocks included such dazzling Atlantic Rainforest jewels as Red-necked Tanager, Green-headed Tanager, and Brazilian Tanager. An isolated snag had a single, diminutive Buff-browed Purpletuft, a bird we had missed at the more traditional sites in Ubatuba. In less than two hours, we were already looking at our life Black-hooded Antwrens rumaging in the weedy Lantana and other low vegetation growing along the roadside. They flit across the road a couple times, actively vocalizing while remaining mostly hidden. 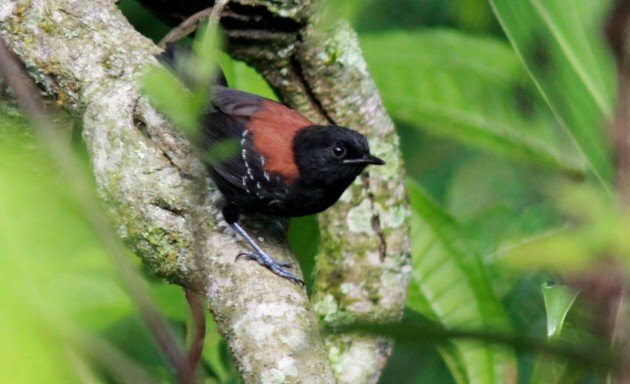 Despite this site being a few hour’s drive from Rio de Janeiro, these active and animated little birds had escaped detection for almost a century. With the recent description or rediscovery of two antwrens, two tapaculos, a tody-tyrant, a tanager, and a few others, what else is hiding in the green hinterlands surrounding two of the largest megalopolises in the world? With the recent rise in popularity of birding and ornithology in Brazil, hopefully all of these obscure and highly range-restricted species will have supporting voices for their conservation. Cool post Carlos. I wonder how much biodiversity was lost before being described. The destruction of those forests is such a tragedy. At least REGUA gives some hope that restoration is possible. Virginia’s Warbler in Alley Pond Park, Queens, New York Refound!